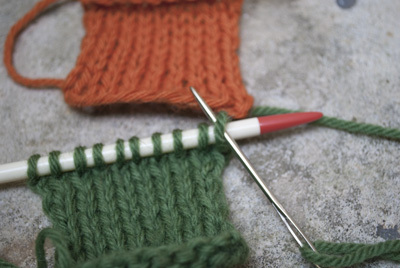 Grafting is a technique unique to knitting – a way to join two open ends with a row of fabric instead of a seam. 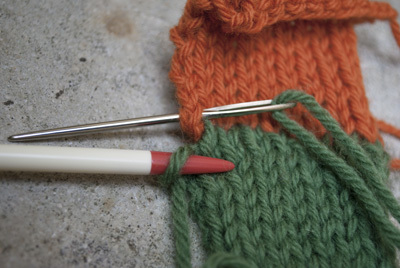 This tutorial demonstrates how to graft open stitches to a cast-on. I used this technique in my Little Froggy pattern. 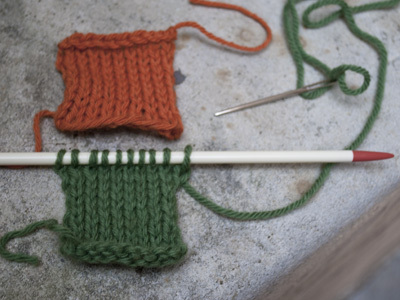 NB: When I had this tutorial tested, we ran into different definitions of purl-wise and knit-wise, stemming from our different knitting styles. When I say purl-wise, I mean bringing the needle from the back of the work to the front, through the leading leg of the stitch. 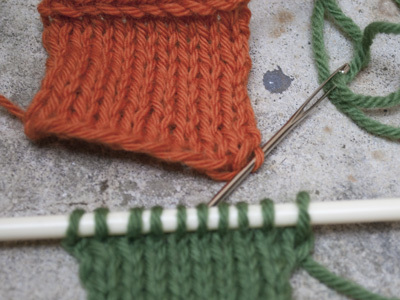 Knit-wise means taking the needle front to back, through the leading leg of the stitch. 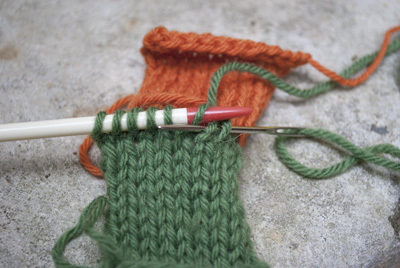 I used the backwards loop cast-on because I find it the easiest to graft to – the loops are less bulky than other cast-on methods. Getting started is often the trickiest part. 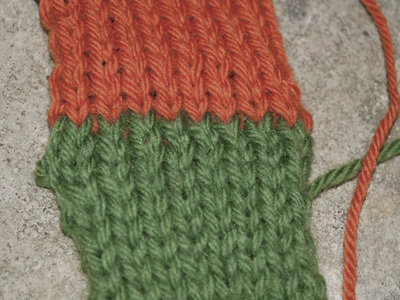 The goal is to come purl-wise through the left hand leg of the edge stitch. To find the edge stitch, I always look for the Vs, and then go as far out to the edge as I can. The half of the V that is near the edge is the one I thread the needle through. 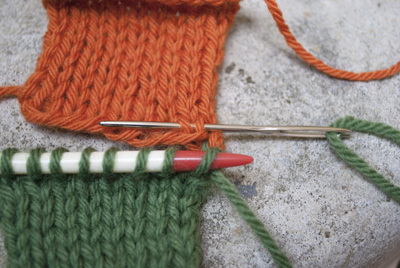 Then you going knit-wise through the first leg of the live stitch on the needle. This is where you go front-to-back through the first leg of the live stitch on the needle. (My knit-wise may look slightly different because I am a combination knitter). Remember that V from the second picture? Now we’re going to “hug” it. 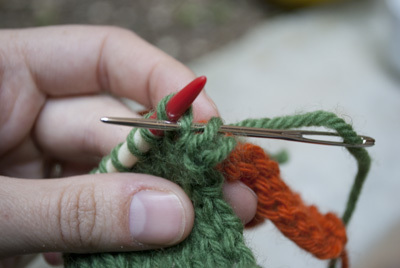 Now you go knit-wise through the first loop on the needle, and drop it off the needle. 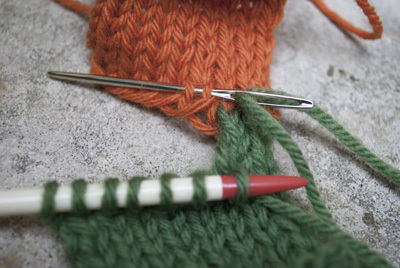 Then go purl-wise(back-to-front through the first leg) through the next stitch on the needle. 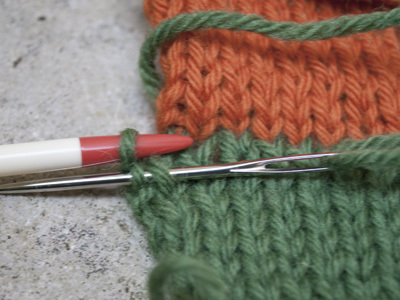 …thread the needle knit-wise through the first stitch on the needle, dropping it off the needle, and go purl-wise through the next stitch. Continue until the last sts…. 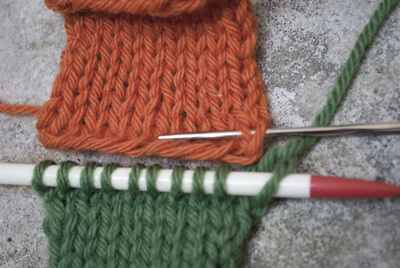 Here I have done step 3 on the last 2 stitches of the left needle. I “hug” the last complete V on the cast-on piece…. 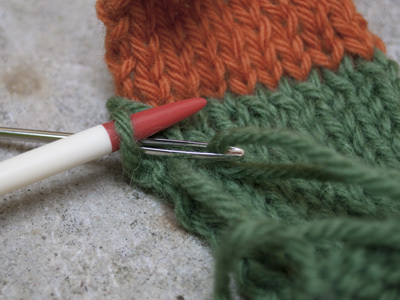 …and go knit-wise through the last stitch on the needle, dropping it from the needle. Weave in the ends, and we’re all done!